The West Kent Stewards Lodge put on a demonstration of the Third Degree at Sidcup on Friday 29 June. A good thirty brethren in the audience made the event very worthwhile, especially as there was a good mixture of "young and old", showing that there is an interest in Masonry right across the membership of the Province. 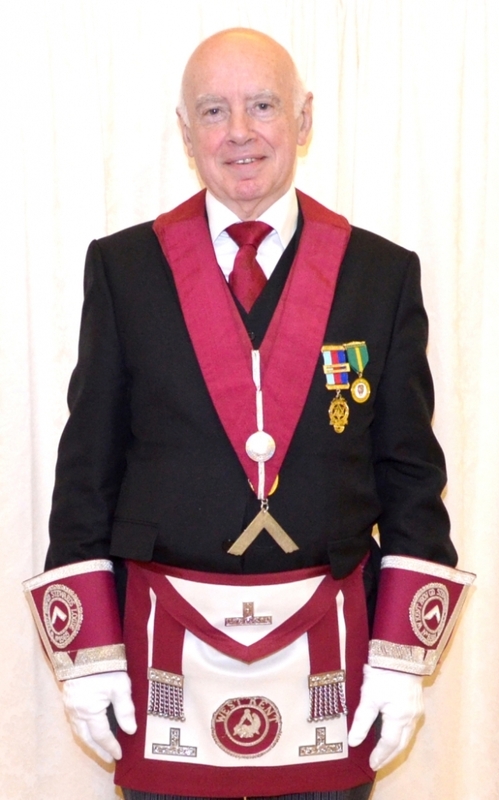 Special thanks must go to Bro Ollie Jarvis of Mountsfield Lodge 6548 for acting as candidate for the evening. Also, a pity the W.Bro Nick Dono had to leave before the photograph. On behalf of our IPM, W Bro Paul Christopher, I presented a donation of £1012 from The West Provincial Grand Stewards’ Lodge 8565 to W Bro Barrie Evans, Deputy Chairman of the Association of Friends, Chislehurst. This was raised from the raffle and proceeds from Paul’s Spring Luncheon which was his last Social event during his year as Master of the Lodge. The donation was approved at the Installation meeting on 9th June and thus qualified for matched funding from the surplus raised during the CALM appeal. At that meeting and following the approval of the donation the Provincial Grand Charity Steward W Bro Roland Stokes rose to confirm that matched funding capped to £500 would be made available. That £500 was transferred to the Association of Friends today. Barrie asked me to convey heartfelt thanks to the Master and Brethren of the Stewards’ Lodge for their generous donation and the CALM team for the resultant match funding bring the total to £1512, not forgetting the Lodges and Chapters that gave so generously to that appeal. He thanked the Lodge on behalf of the Chairman, W Bro David Barber, Barrie himself as Deputy Chairman, the Treasurer W Bro Andrew Houston and the rest of the committee but especially the residents of the home who will be the ultimate beneficiaries of these donations. An excellent West Kent Provincial Grand Stewards' Lodge Sunday Lunch on 20 May, held in beautiful weather in the beautiful surroundings of The Warren sports club. 120 adults and 8 children sat down to a most enjoyable lunch hosted by the Master, WBro Paul Christopher and his lady, Rachel. Not only was an excellent time enjoyed by all but a total of £1,012.00 was raised towards the Master's nominated charity, the Association of Friends, Duke of Kent Court. Many congratulations to Paul and Rachel and many thanks to everyone involved in organising such a successful event. 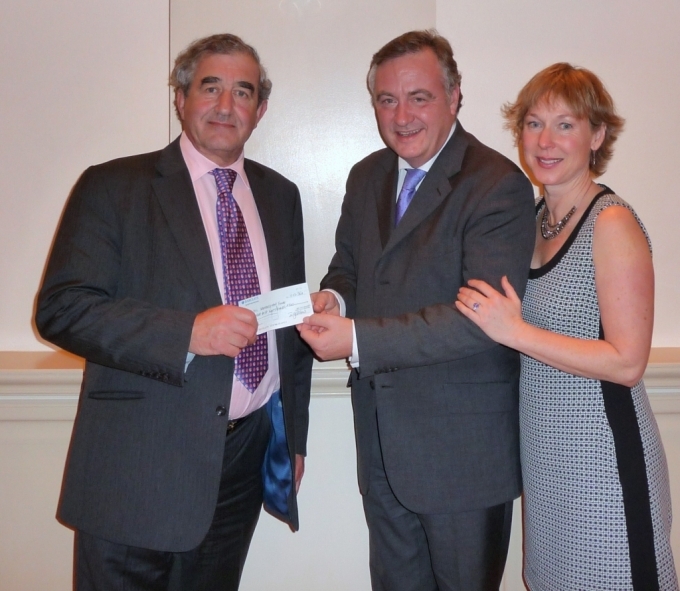 The Worshipful Master and his lady, Rachel, attended the offices of the Chartwell Cancer Trust to present a cheque in the sum of £1,327.00 which was raised at the Christmas Sunday Lunch on the 10th December 2017. The Lodge received a thank you letter acknowledging the sum raised, outlining their work and thanking the brethren for their generosity. An excellent Sunday Lunch on 10 December at Oakley House, hosted by West Kent Provincial Grand Stewards' Lodge 8565. Congratulations to our Worshipful Master, WBro Paul Christopher, on a successful event, enjoyed by a packed room and raising £1,327.00 for the Chartwell Cancer Trust. Well done also to Rachel on her response. Many thanks to Daniel J Spencer for his inimitable organ playing, making the carols and festive songs so enjoyable. lastly, thank to Hari Williams and Tim Perrin for organising the event for us all. Another excellent event by West Kent Stewards! An enjoyable evening at Oakley House on Friday 28 April when the West Kent Stewards Lodge, under the title of the North East Corner Club, put on a demonstration of the First Degree. The evening was about delivering a commentary for new and experienced Masons explaining some of the aspects of the ritual, which might have been lost or forgotten with the passage of time. Some 35 members attended with a good number of much newer Brethren, a few of whom posed for a picture with the team after the event. Many thanks to Bro Martin Wells for standing in as the candidate and to the PG Mentor, WBro John Perkins, for supporting the event and taking the time to address the group at the end of the demonstration. 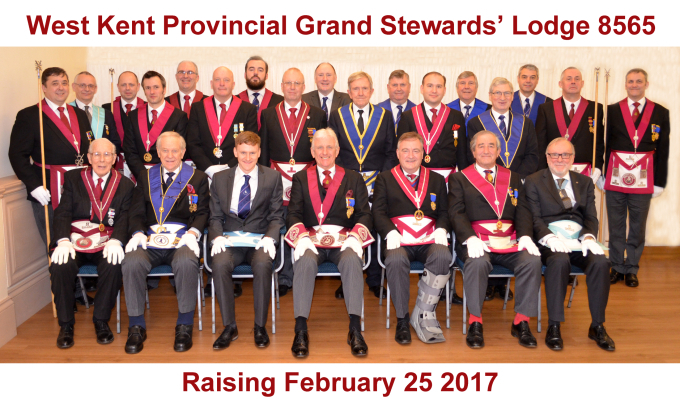 Saturday 25 February saw a unique event take place at West Kent Provincial Grand Stewards’ Lodge. On behalf of Camden Place Lodge 3042, the Lodge was delighted to Raise Bro George Edward Strong to the Sublime Degree of Master Mason. A raising, of itself, is not an exceptional event but this ceremony has two very unique features. Firstly, this was the first Raising carried out by the Lodge. It was excellent to see the Offices occupied by newer members of the Lodge and Bro George was treated to an excellent ceremony by very enthusiastic and well-rehearsed participants. Secondly, Bro George is the great-grandson of RW Bro J C H “Jack” Twallin, our Primus Master and Past Provincial Grand Master. A great honour for the Lodge and, of course, for Bro George. With a donation of £1,500 towards the Provincial Tercentenary Appeal being ratified by the Lodge, West Kent Provincial Grand Stewards’ Lodge once again demonstrated that it is at the forefront of supporting the Province and working to keep West Kent Masonry the excellent and thriving institution that it is. An excellent West Kent Provincial Grand Stewards Sunday Lunch on 11 December 2016 at Oakley House. With over 230 sitting down to lunch, the room was packed and a happy buzz lasted for the whole afternoon. As ever, next to having fun was the charitable aspect of the day and with the event raising £1,170 for St Christopher's Hospice as well as an additional raffle in favour of Bro Charity Steward's Scout Troop, we can easily state that the day was a success. With a present for all the children attending and singing led by Danny Spencer, the day was an excellent start to the Festive Season. Many thanks to everyone involved in arranging the day and to our president, WBro Eric Hampson, and his wife and party for presiding over the event. More photographs in the Lodge Gallery. On 30 November, the West Kent Provincial Grand Stewards' Lodge 8565, under the auspices of the North East Corner Club, put on the last demonstration of 2016. This time, it was a demonstration of the Ceremony of Raising and was held at Sidcup Masonic Centre. On a somewhat cold evening the preparation paid off as an entertaining demonstration and commentary were delivered to the hardy band that had ignored the temperature to join in the last event of the year. A good evening, let's hope 2017 will also be a success! 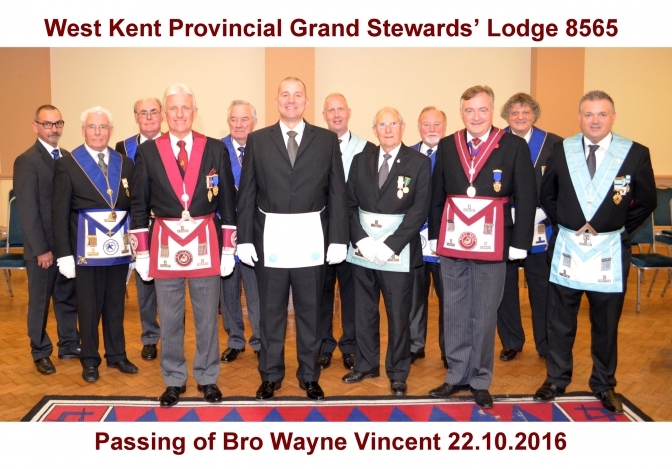 Saturday 22 October 2016 saw a really excellent meeting of West Kent Provincial Grand Stewards' Lodge 8565. The WM, WBro Eric Hampson, led his team in an outstanding Ceremony of Passing. The Candidate was Bro Wayne Vincent of William Sennocke Lodge 6932. A “live” Passing is a rare event in the WKPGS Lodge and it was excellent to see a good delegation from William Sennocke Lodge attending to support Bro Wayne as he embarked upon this somewhat daunting leg of his Masonic journey. The PGM, RW Bro Mark Estaugh, a member of the Lodge, joined the team and William Sennocke delegation for pictures later. Some 120 members enjoyed a happy and convivial Festive Board afterwards. This was a meeting that will be long remembered by participants and observers alike. 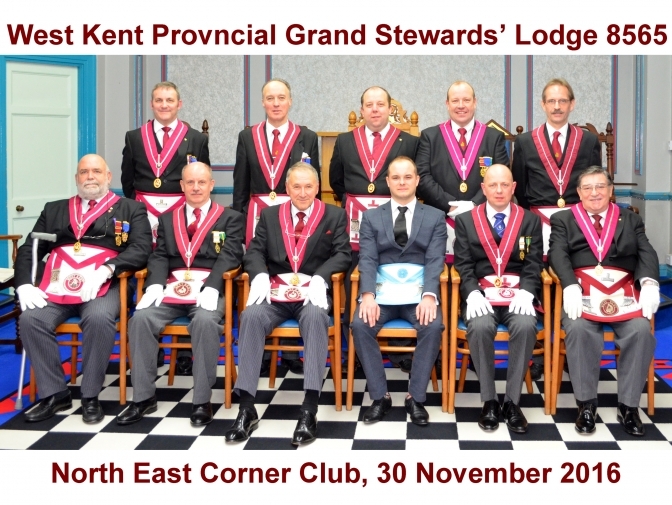 If you have never attended a meeting of the West Kent Provincial Grand Stewards’ Lodge, why not ask a member? A warm welcome awaits you in the future. 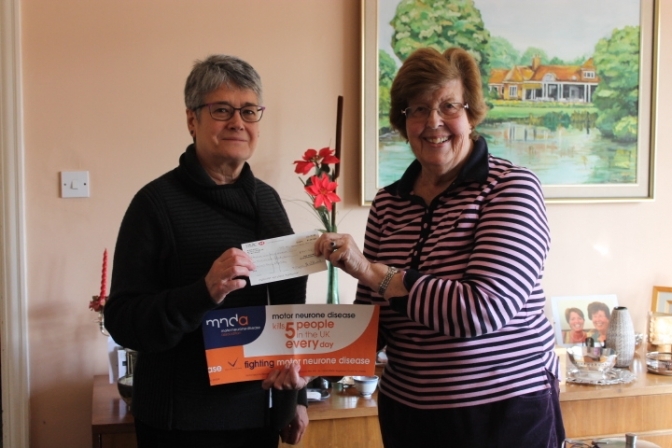 The Photograph shows the Worshipful Master’s wife, Mrs Sian Halligan, presenting a cheque for £527.50 to Mrs Jean Nicholson-Smith, Chair of the West Kent Motor Neuron Disease Group. 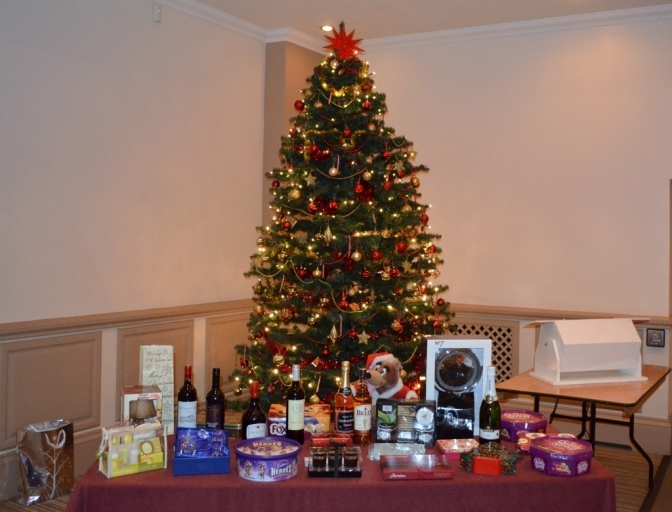 The money was part of the charitable giving at the Stewards' Lodge Christmas Lunch where a total of over £1000 was raised. 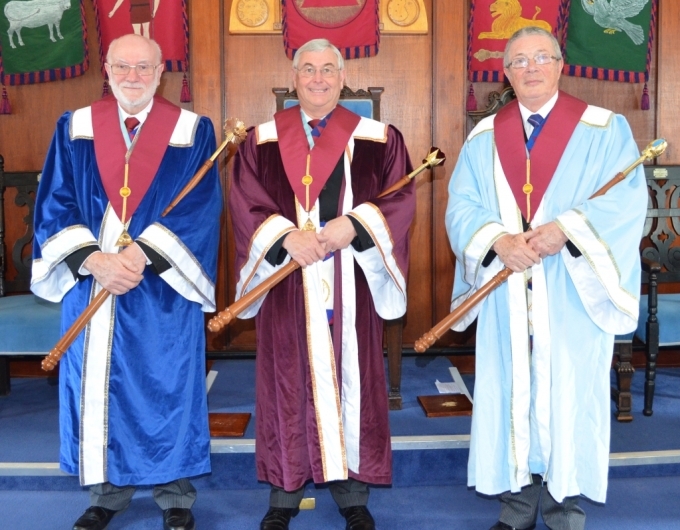 On Saturday 24th October 2015 the Provincial Grand Stewards’ Lodge No. 8565 held a special meeting at Oakley House. In addition to hosting a number of honoured guests from other Provinces the Lodge was pleased to welcome the newly Installed Provincial Grand Master, RW Bro Mark Estaugh, the Past PGM RW Bro Jonathan Winpenny accompanied by the DPGM, VW Bro Chris Roberts and a number of APGMs and Past APGMs. There were 152 present and 146 dining after the meeting. The Charge by Trevor Atkins and the 2nd Tracing Board by John Head. 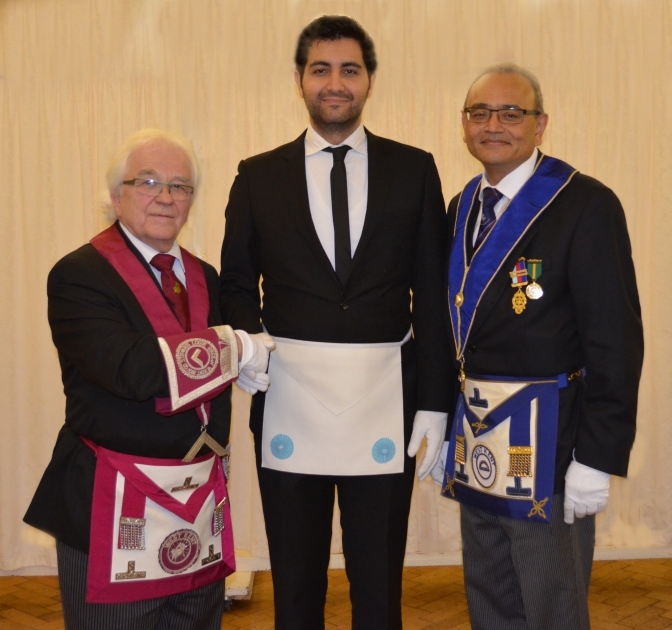 The team were led by the Lodge DC Perri Ahmet. Following the ceremony the current year Officers were restored to their positions and the WM W Bro Fred Halligan thanked the Ceremony team for their sincere and excellent work. He also congratulated the candidate on his being Passed in this prestigious Lodge in the company of distinguished Brethren. The PGM was then pleased to invest W Bro Roland Stokes as the Provincial Grand Charity Steward. West Kent Stewards Lodge 8565 Christmas Lunch 2014. On Sunday 14 December 2014, West Kent Provincial Grand Stewards’ Lodge 8565 held its annual Sunday Christmas Lunch in the pleasant surroundings of Oakley House. 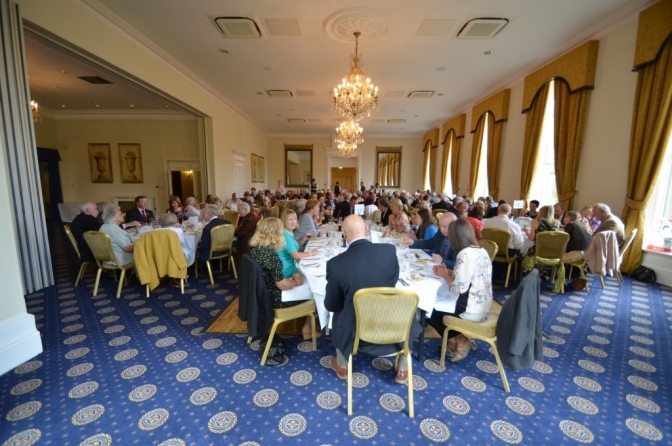 Ever a popular event, some 199 members and guests sat down to lunch and enjoyed a convivial afternoon in the company of family and good friends. This number beat the attendance of the previous year by 3 and demonstrates that the Lodge is more than holding its own! As with the previous year, the event was made all the better by the attendance of the Provincial Choir, otherwise known as the Indigo Singers. 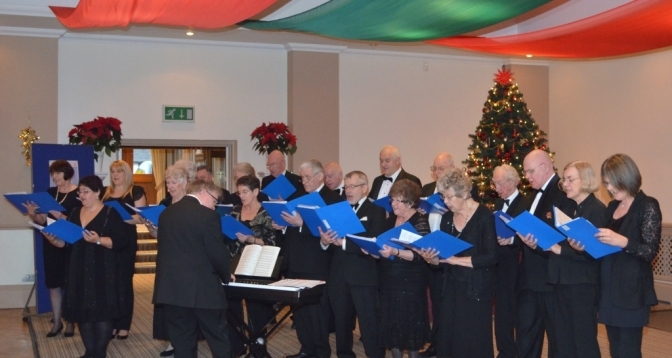 Their rendition of well known carols and songs rounded the event off perfectly. Of course, the Province is getting ever closer to the end of the 2015 Festival so it is with much pleasure that we can announce that the event raised £850 for the Festival. An excellent afternoon rounded off with the pleasing knowledge that everyone involved helped to make such a positive contribution to an important Masonic charity. 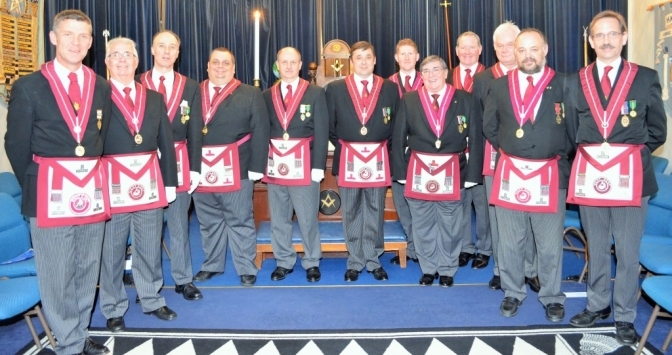 On Saturday 14 June 2014, the Lodge was honoured as V. W. Bro. 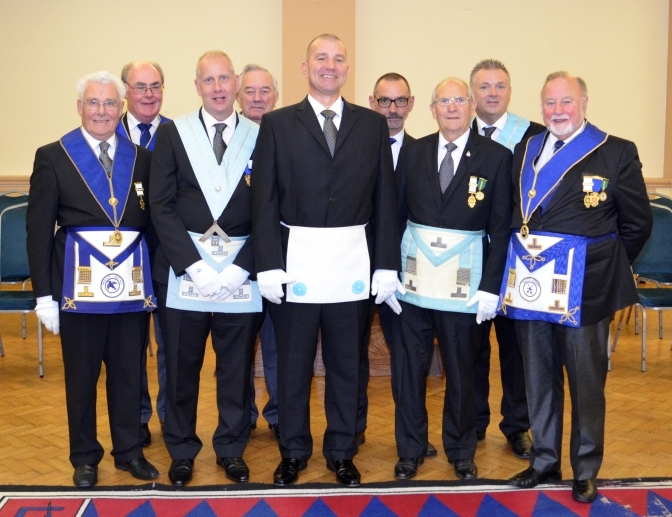 Christopher Roberts DPGM was Installed as Worshipful Master of the Lodge. In fact, it was hard to work out whether the Lodge felt more honoured than V. W. Bro. Chis or vice-versa! 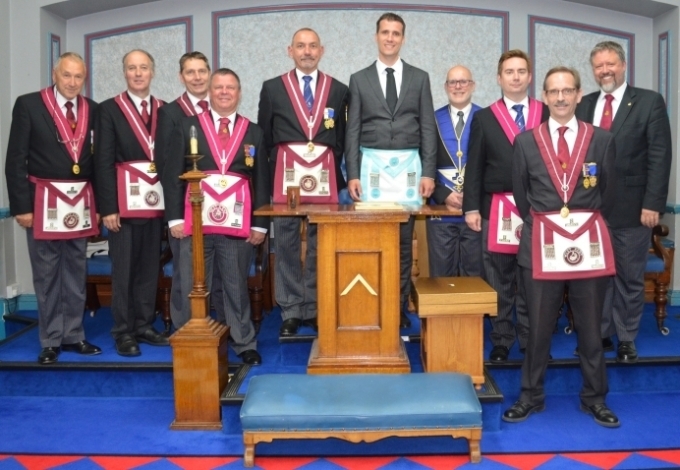 The Installation ceremony was carried out by the outgoing Master, W. Bro. Keith Collcutt. While this would not usually be the subject of comment, everyone was aware that W. Bro. Keith has been managing some significant health issues. Notwithstanding this, W. Bro. Keith conducted a ceremony, of which anybody would be proud. 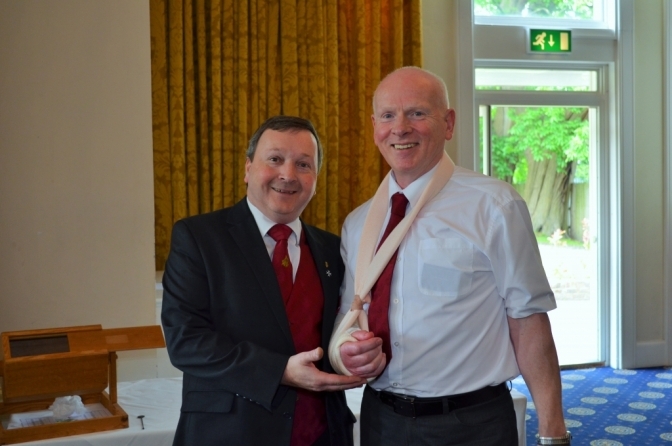 This tremendous effort rounded off a year of dedicated service from W. Bro. Keith as Master of the Lodge. V. W. Bro Chris spoke in the Lodge and at the Festive Board, making it very clear that he felt tremendously honoured to have been entrusted with the Mastership of the premier Lodge in the Province and declared his intention to ensure that the Stewards' Lodge remains at the forefront of Provincial activity. With V. W. Bro. Chris at the helm, there is no doubt that the Lodge is at the beginning of an excellent year! On Sunday June 1, 2014, the Lodge held its annual Sunday lunch. This was again in the splendid setting of the Spa Hotel in Tunbridge Wells. Fortune again smiled on the Lodge as the weather held and, as can be seen in the pictures, the hotel and grounds were bathed in glorious sunshine. 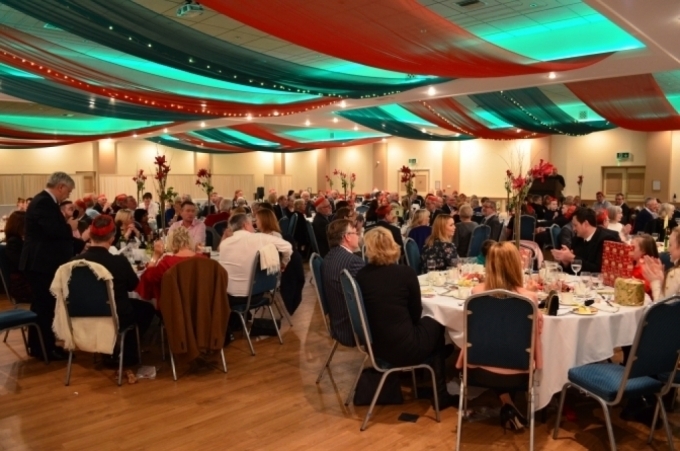 Some 131 members and guests booked in to dine and, as before, a lively and happy atmosphere pervaded the entire event. It was a matter of regret to all present that the Master and President, W. Bro Keith Collcutt was unable to attend due to being unwell. Everyone present wished Keith all the best and we all look forward to seeing him again very soon. As Immediate Past President, W. Bro. David Ferdinando, in the delightful company of his mother, stood in for the day and the picture shows David's mum receiving a bouquet of flowers from the Lodge to thank her for standing in with David. No Stewards' event would be complete without the charity team taking the opportunity to support the Lodge and the Province. As can be seen in the picture, the Charity Steward, a wounded W. Bro Ray Collings, and his assistant, W. Bro Stuart Gray, ran the raffle in their customary, entertaining manner. A total of £690.00 was raised, which will significantly boost the Lodge's support for the 2015 Festival. What could be better than a good lunch in good company and raising such a brilliant sum of money towards the Festival? 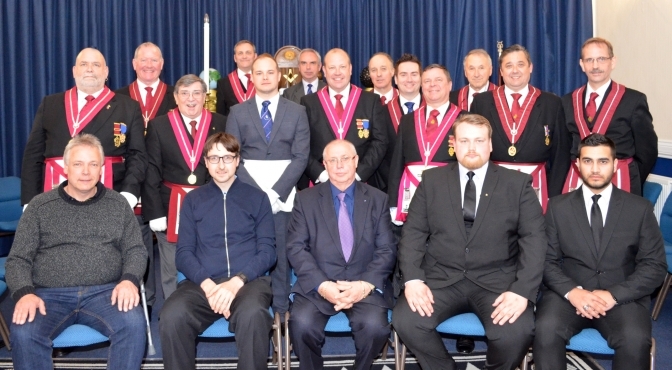 On Tuesday 29 April 2014, as part of the Provincial mentoring scheme, the North East Corner Club (NECC) was relaunched by the West Kent Provincial Grand Stewards' Lodge 8565. 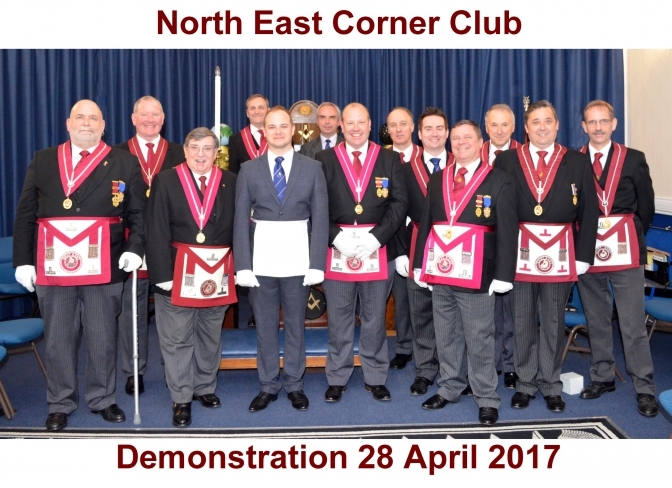 Appropriately for the North East Corner Club, the relaunch took the form of a demonstration of the First Degree ceremony together with a commentary, giving an explanation of some of the more obscure and/or lost aspects of the ritual. The meeting was open to all with a special emphasis on newer Masons, who might use the event to broaden their knowledge of and interest in the Craft. As it was, some 98 Masons attended the demonstration, into which the team performing the ritual had put much effort. The evening ended with everyohne feeling very positive about the event and good, constructive feedback being provided by those attending. It is hoped that this event marks the beginning of an ongoing series of events by the NECC. Particular thanks must go to W. Bro. Perri Ahmet, the Mentor of the West Kent Provincial Grand Stewards' Lodge, for all his hard work in assembling the team, arranging rehearsals and making sure the event passed off smoothly. The Demonstration Team relaxing after the event. Ex. Comp. / W. Bro. Geoff Whale is well known around West Kent Province, not least in the West Kent Stewards' Lodge. 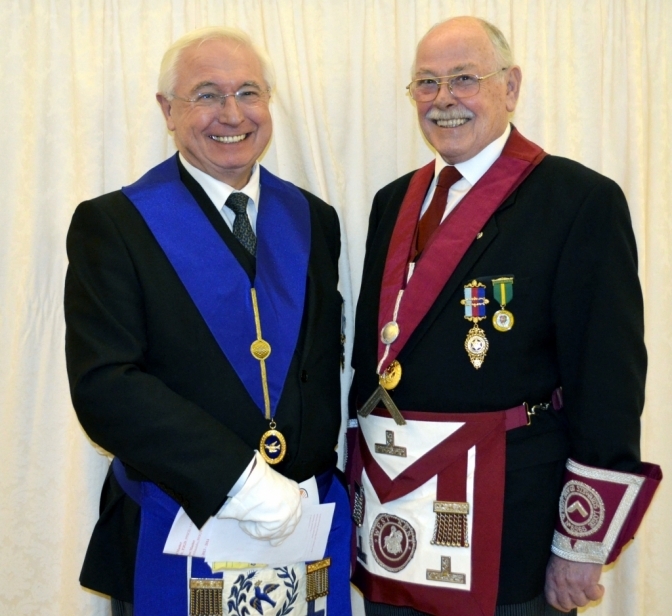 His commitment to serving the Province and Masonry in general has been recognised many times. The West Kent Stewards' Lodge 8565 is a service Lodge, working for the good of West Kent Province. 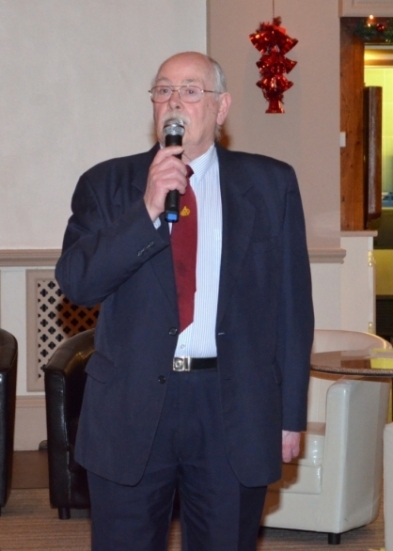 Geoff's involvement and efforts were acknowledged when he was made Worshipful Master of the Lodge in 2009. Ex. Comp. 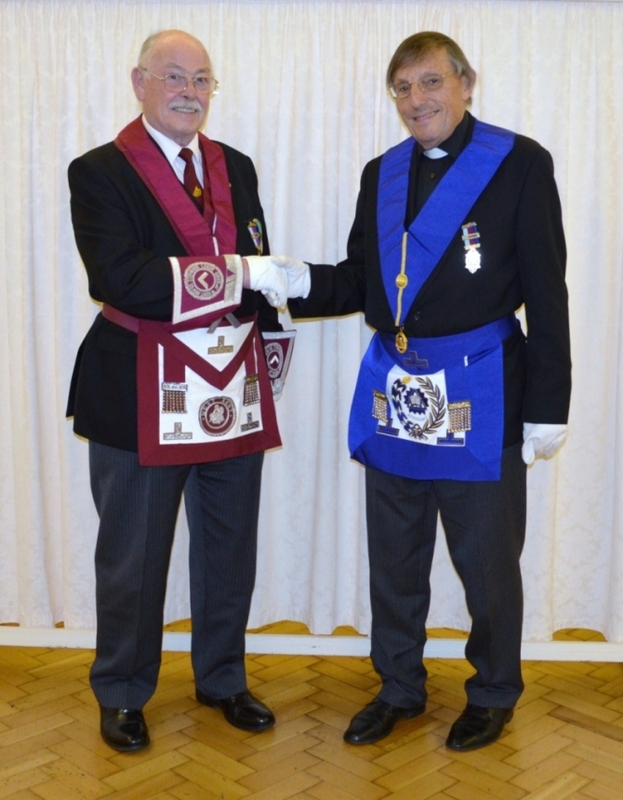 Geoff completed the "double" when he was Installed as First Principal of West Kent Provincial Grand Stewards' Chapter on 5 April 2014. Only a truly worthy Mason would be accorded such an honour. This is a genuine reflection of and just reward for Ex. Comp. / W. Bro. Geoff's work as a Mason. Ex. Comp. George Delves, Second Principal, left, Ex. Comp. Geoff Whale, First Principal, centre, and Ex. Comp. John Woodley, Third Principal, right. As everyone will be aware, we are approaching the 100th anniversary of the start of the First World War. To many of us, this was a conflict from a distant past, indeed my father was born in 1916, midway through the conflict. We all, however, appear to share a view that, regardless of the rights and wrongs of the conflict, we should never forget the sacrifice made by so many on both sides. It was, therefore, with great interest and anticipation that the West Kent Provincial Grand Stewards' Lodge 8565 invited W.Bro. Dr John Reuther, PJGD, PProvSGW (East Kent), Deputy President RMBI, to deliver a lecture at their meeting on 22 February entitled "Freemasonry and the Great War". W. Bro. John captivated everyone with the content and style of his delivery. His explanation of the role of Freemasonry on both sides of the conflict, as well as in prison and internment camps on both sides, was a revelation to everyone and certainly provided an additional and completely different aspect of the war for his audience to consider. It would be fair to say that many of the matters described were moving as well as interesting as the human cost of a distant conflict were made almost tangible for the audience. In an era, when we are acutely aware of the need to ensure that we continue to recruit suitable people into The Craft, we can reflect on W. Bro. John's lecture and hope that Freemasonry and its principles can be strong and far reaching enough to prevent such a conflict from ever occurring again. WM, W. Bro. Keith Collcutt, thanking W. Bro. John and congratulating him on such an excellent lecture. W. Bro. Ray Collings is one of the most active Charity Stewards in the Province if not the entire Craft! On Saturday January 25, 2014, on behalf of the West Kent Provincial Grand Stewards' Lodge No 8565, W. Bro. Ray hosted a Burns Night at Oakley House. This was a spectacular event with some 130 guests enjoying the evening. The event started in traditional fashion with Mr Victor Murrell, the Piper for the evening, playing some traditional Scottish pipe tunes before piping the Haggis as ancient tradition demands. Having delivered the Selkirk Grace, W. Bro. 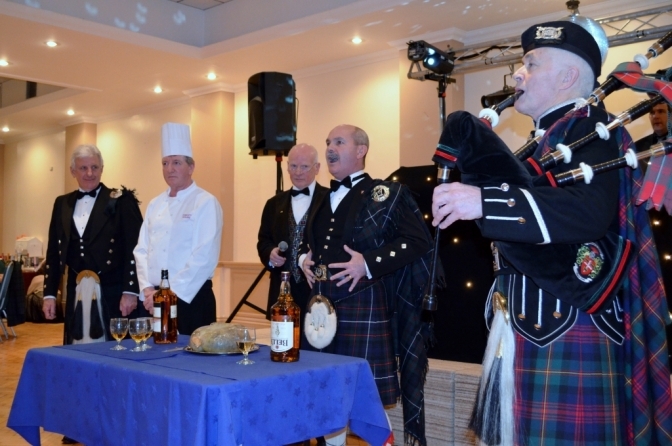 Archie Torrance delighted the gathering with the address to the Haggis, as shown in the pictures below, presented with his traditional aplomb! His delivery was as impeccable and entertaining as ever and left many of us wishing we were also bilingual! Tam O’Shanter was then recited by W. Bro. Bobby Smith, who followed up with the toast to The Immortal Memory of Robert Burns. W. Bro. Bobby’s flawless and unprompted rendition of Tam O’Shanter was truly astounding and made reciting a Masonic Tracing Board look easy! The toast to the Ladies was proposed by W. Bro Ray Collings and an excellent response was delivered by Ms Shelagh Fitzpatrick. The evening had two purposes; to have fun and enjoy good company but also to raise monies for the 2015 Festival in support of the Masonic Samaritan Fund. To assist with this, W. Bro. 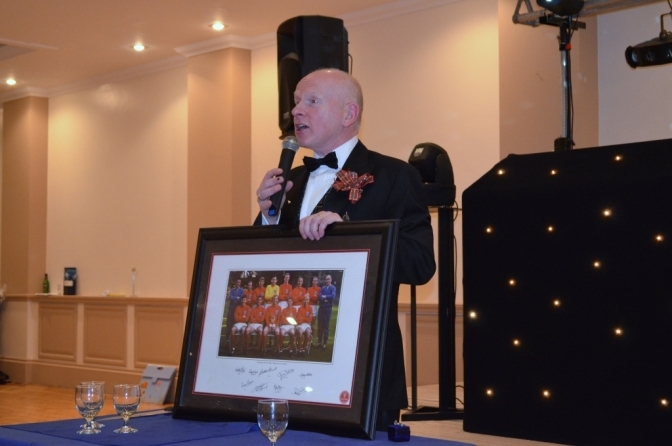 Ray acted as Auctioneer and excelled at his task. The evening would not have been complete without some Scottish dancing. 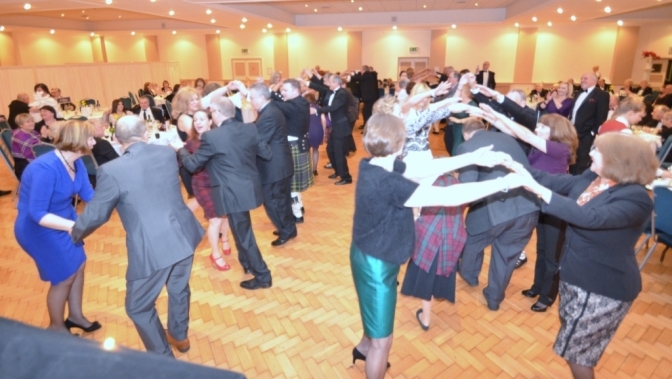 Following a display of dancing skill, the Orpington and District Caledonian Society had little difficulty in convincing the majority of guests to join them for instruction and entertainment. Dancing to Tuxedo Class extended into the evening. 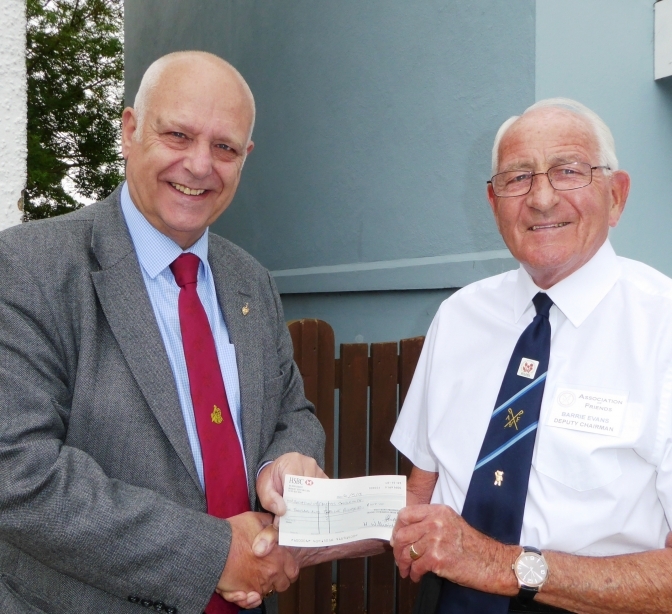 W. Bro Ray’s effort and determination saw a staggering £1,500 raised towards the 2015 Festival. Grateful thanks are due to everyone, who patronised the event and helped to make it such a success. 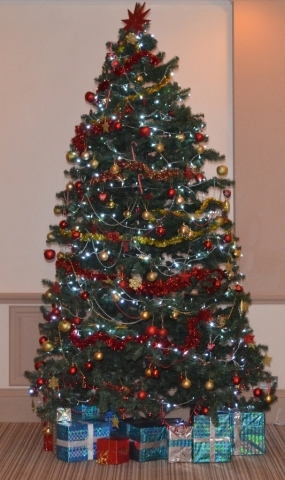 On Sunday 8 December, the Lodge held its annual Christmas lunch at Oakley House. There was a tremendous turnout, with some 196 members and guests attending the event. The staff at Oakley House had been working until 2am to get the tables set up and make sure that all plans were in place. Thanks to the staff, the event ran smoothly with everybody thoroughly enjoying the afternoon. The event was made all the more enjoyable by the presence of the Provincial Choir, the Indigo Singers, who delighted everyone with a rendition of traditional carols and songs as well as an enjoyable, interactive version of The twelve days of Christmas. 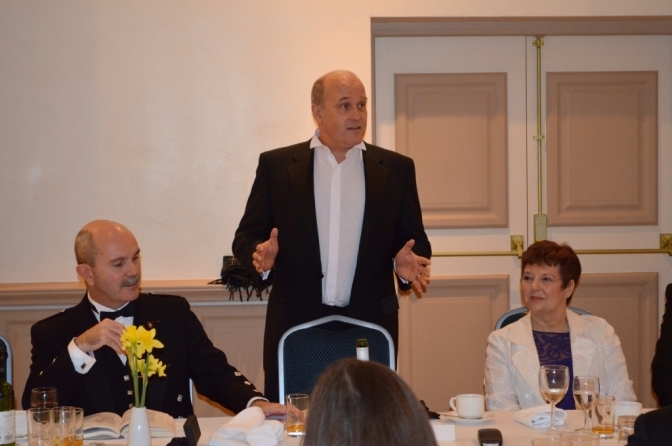 The President, WBro Keith Collcutt, thanked the choir and everybody for attending and making the event so enjoyable. The raffle raised a staggering £1,030.00, from which a donation will be made to the choir with the rest supporting the 2015 Festival. 196 Members and Guests Sat Down To Dine. The Indigo Singers Entertaining The Members And Visitors With Traditional Christmas Carols. The Worshipful Master Thanking and Congratulating The Members And Guests. 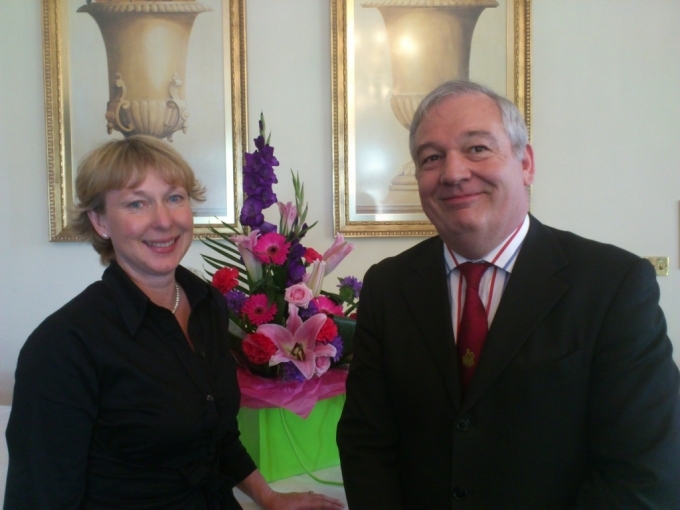 On Saturday 26 October 2013, the Lodge had the privilege of hosting the first presentation of the Cornwallis Lecture 2013. Entitled “Freemasonry and Religion”, the lecture was delivered by W.Bro The Reverend Philip Cox, Past Assistant Grand Chaplain. As can be seen from his titles, it would be hard to find a Brother more suitably qualified to lecture on such a topic! The lecture was fascinating and a rare delight for all present. The topic is complex and challenging yet W.Bro Philip managed to deliver his talk in such a way that the audience was led easily through the various points, coming out at the other end with increased understanding and a sense of having listened to something quite special. The simple point from the meeting is this; if you get a chance to attend this Cornwallis Lecture, do not miss the opportunity! The picture shows the Worshipful Master, W.Bro Keith Collcutt, thanking W.Bro Philip for making the meeting so enjoyable for the Members and guests present. 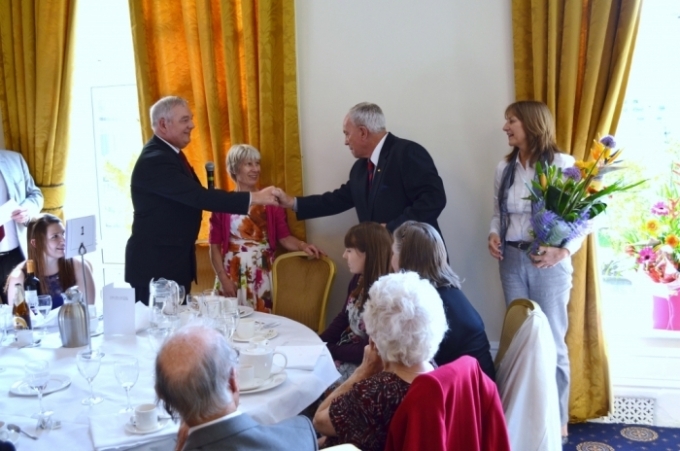 The West Kent Provincial Grand Stewards’ Lodge held its annual family lunch on Sunday 26 May at the Spa Hotel in Tunbridge Wells. 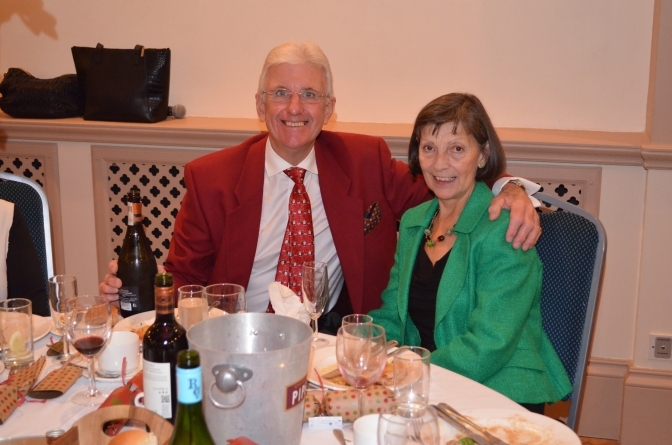 The President and his Lady, W. Bro David and Carole Ferdinando, presided over a gathering of some 122 members and guests. The bad weather of the previous days changed into a glorious spring day, adding significantly to the ambience of the event. 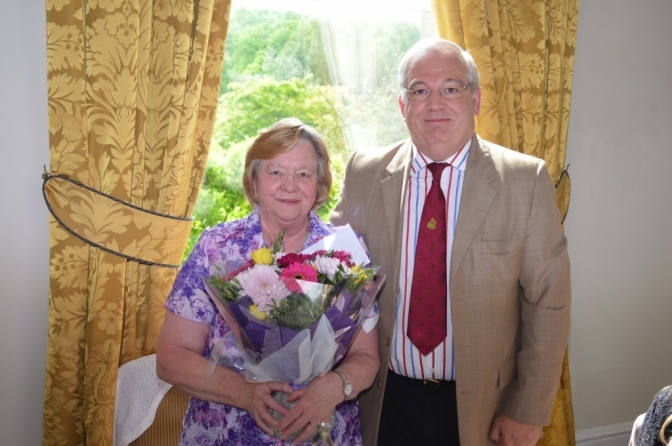 A noteworthy addition to the day was the presentation of a bouquet of flowers to Mrs Diane Warner to celebrate the milestone that her husband and member of the Lodge, W. Bro Tony Warner, had the day before the luncheon celebrated 50 years in Masonry. Thanks must again go to W. Bro Paul Christopher and W. Bro Hari WIlliams, without whose hard work events such as these simply would not happen. Additionally grateful thanks to W. Bro. Stuart Gray for organising and running the raffle and to W. Bro. Ian Gallehawk for providing the photographs of the day. The raffle raised an amazing £610, which W. Bro David decided would be donated to the Masonic Samaritan Fund as part of the Lodge's ongoing support for the 2015 Festival. This was another thoroughly enjoyable West Kent Provincial Grand Stewards’ Lodge event. Everyone left looking forward to supporting W. Bro Keith Collcutt over the coming 12 months. W. Bro. David congratulates W. Bro. Tony Warner and presents a bouquet of flowers to Mrs. Dianne Warner, W. Bro. Tony having completed 50 years in Freemasony the day before the family luncheon. 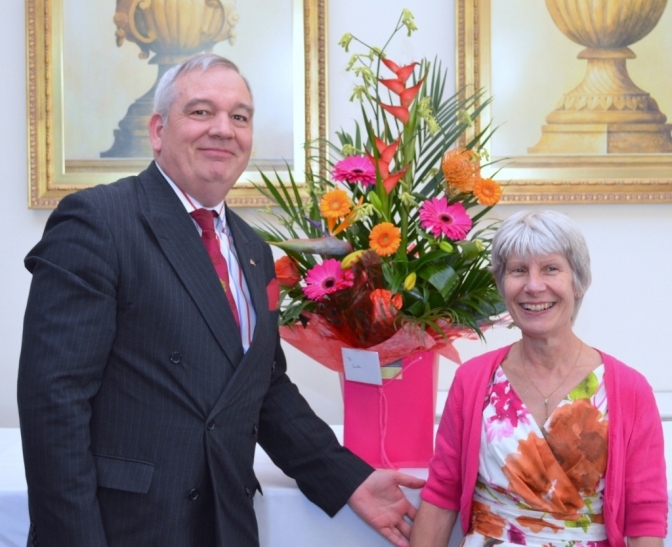 The President and his Lady, Carole and the bouquet from the Lodge presented to the President's Lady by W. Bro. Mark Estaugh, Immediate Past President. 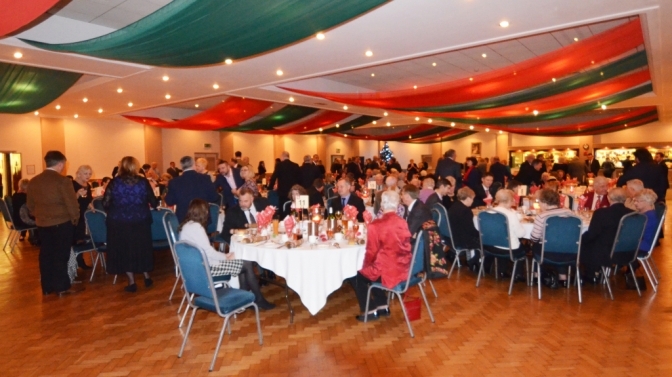 On Sunday 9th December the Lodge held its annual Christmas lunch. 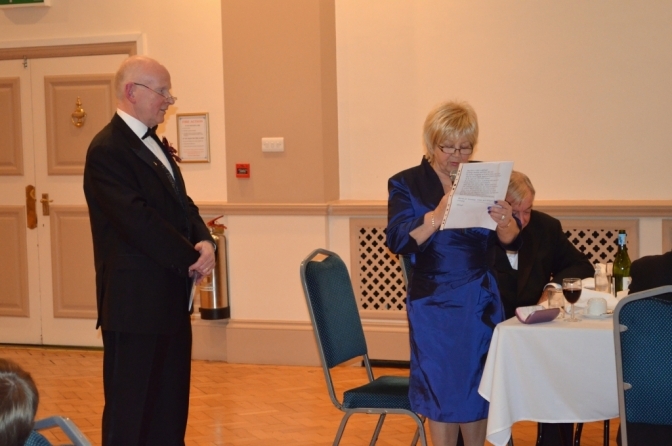 This was presided over by the WM, WBro David Ferdinando and his wife Carole, who welcomed some 120 guests. This event was made even more special by the Provincial Choir, the Indigo Singers, delivering a variety of seasonal classics as well as some not so well known songs. This added considerably to the festive nature of the event. The raffle raised £710 and a further £15 in fines, including a fine for the President for not wearing the Stewards Tie. Bro David decided that the sum raised would be evenly divided with half going as a Lodge contribution to the 2015 Masonic Samaritan Fund Festival and half to the Indigo Singers, who are really beginning to make an impact on the Province. Thank you to everyone who donated prizes. The pictures show the WM and his lady with the flowers presented to her on behalf of the Lodge as well as some of the Indigo Singers with their musical director, Dr Christopher Parker, looking suitably pleased with the performance of his team. The available tax reclaim should be in the region of £162. That takes the charity collection to well over £700 in total. Congratulations to all members and guests. 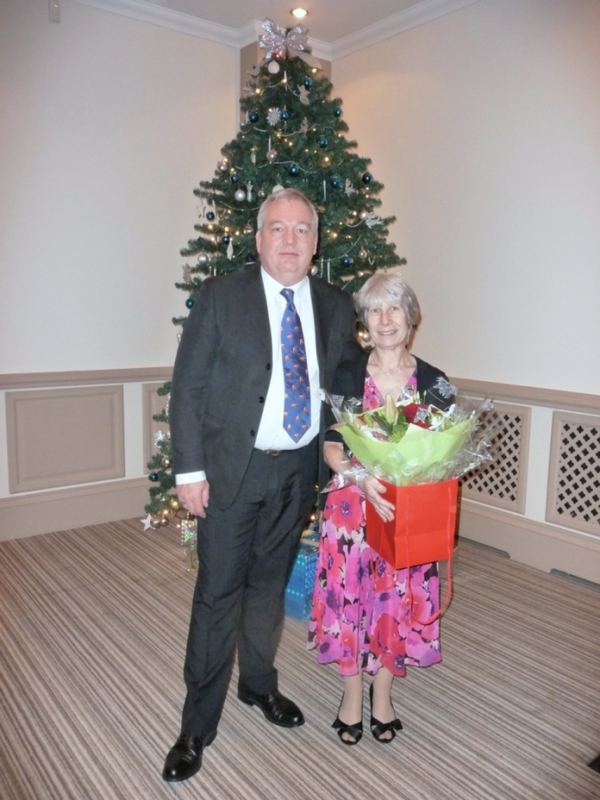 On Sunday 27 May, the Lodge held its annual Sunday Lunch at the Spa Hotel in Tunbridge Wells. 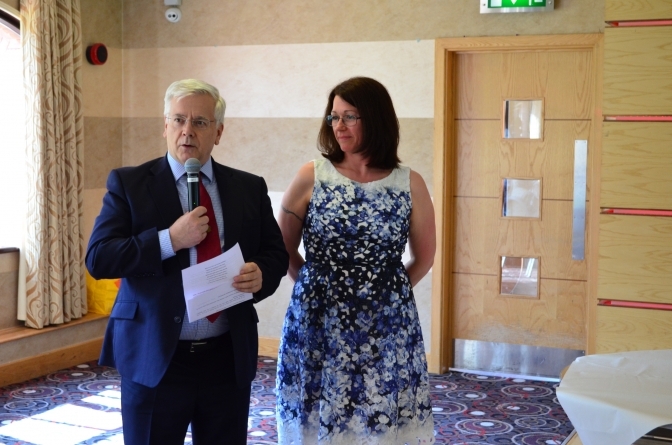 The President and his lady, WBro Mark Estaugh and Ms Laura Creaney were pleased to welcome 132 members and guests. Mark selected the Masonic Samaritan Fund 2015 Festival as the chosen charity for the event and the raffle raised an amazing £680 towards the Festival. The beautiful weather added to the happy atmosphere, and the event proved to be a fitting end to Mark's year as Master of the Lodge. The picture shows Laura receiving a bouquet of flowers from the Master Elect, WBro David Ferdinando. 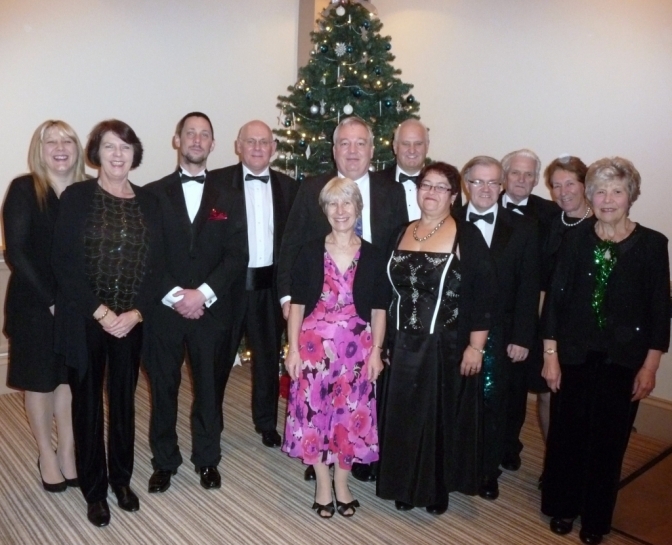 On Sunday 11 December, the West Kent Provincial Grand Stewards' Lodge held its annual Christmas Lunch. Over 110 guests sat down to enjoy a festive lunch at Oakley House. The atmosphere was relaxed and jovial and everyone agreed that this was, once again, an excellent start to the round of Christmas festivities. Thanks go to the Secretary, W.Bro Paul Christopher, who put much effort into ensuring that the day ran smoothly for everyone. The Lodge was privileged not only to have the Worshipful Master, W.Bro Mark Estaugh, and his lady, Laura, presiding over the event but also to have the Provincial Grand Master and his wife amongst those attending. W.Bro Mark was delighted with the attendance and thanked everyone present for their support so far during his year as Master. The raffle proved to be a tremendous success with £560 being raised in favour of the Masonic Samaritan Fund 2015 Festival. 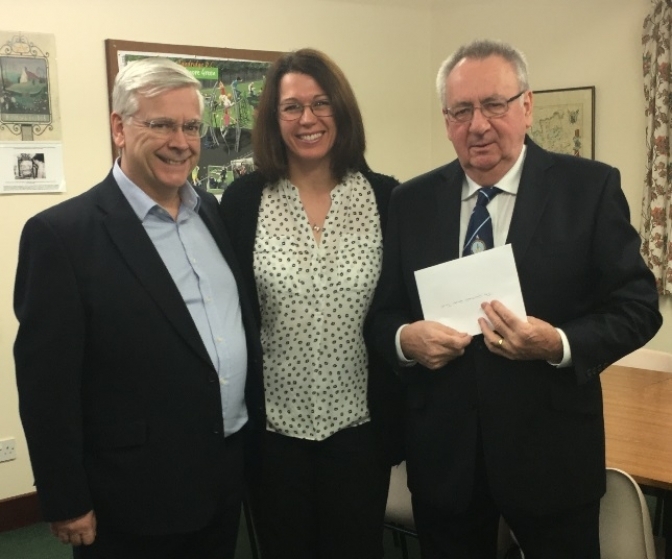 The attached picture shows W.Bro Mark, supported by Laura, presenting a cheque for £560 to the Provincial Grand Master, who expressed his gratitude for the generosity shown by all Lodge members and guests.